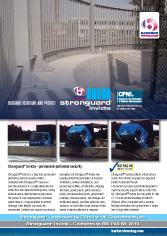 Stronguard™ Invicta is a long term permanent perimeter physical security solution. Combined with Stronguard™ maximum security palisade it is a single defensive line rather than two separate fencing lines, saving valuable space. Mechanised paving means the system is most appropriate in locations where there is a long perimeter to protect. Although short lengths can easily be constructed. Airfields and airports are obvious examples, but Stronguard™ Invicta will equally protect the perimeters of financial institutions, military installations, cash processing facilities, oil refineries, shipping terminals, power plants, petro-chemical plants, pharmaceutical plants, government buildings, chemical plants, fuel storage and distribution depots, sensitive industrial sites, harbours, rail and other major transport hubs where in depth protection is required. Stronguard™ Invicta protects infrastructure assets from threats ranging from peaceful protest to terrorist threats. 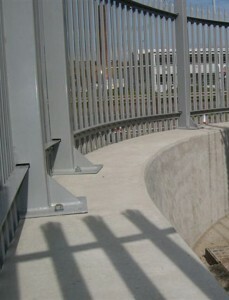 The barrier has been specifically designed to meet the security impact criteria of BSI PAS 68. Stronguard™ Invicta has the ability to stop a 7.5 tonne vehicle travelling at 80km/h (50mph). When combined with a security fencing installation the system offers a single line of high level protection. • Investing in the future – with the installation of Stronguard™ Invicta you are investing in a long term security solution, to protect for years ahead. The design life is 50 to 100 years. • Low maintenance – Concrete is an inherently durable material capable of maintaining its designed engineering properties under conditions of extreme exposure. 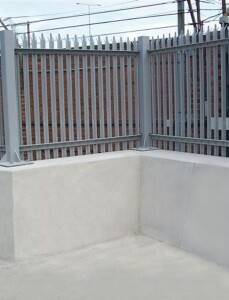 The barrier will require little or no maintenance, apart from a routine inspection. • Protects assets – Stronguard™ Invicta comprises a single high level defensive system for permanent primeter protection, as opposed to the option of separate fencing and vehicle barrier line. It protects assets from a wide spectrum of threats. 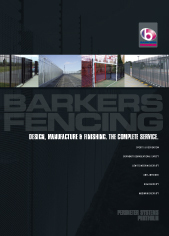 • Experience and expertise – Barkers Fencing has a history of successful concrete barrier installations, in various applications, all installed by highly skilled licensed installers, backed by an independent audit process. • Combined system capability – As well as the Stronguard™ Invicta being a stand alone system for your perimeter, you can combine this in a cost effective way with other solutions such as a range of lighting and CCTV masts. • Predominately surface mounted design – The Stronguard™ Invicta system is designed as a predominantly surface mounted product allowing it to be installed virtually anywhere on a hardened surface without encroaching on buried services or requiring significant excavation works. • Cost effective – Stronguard™ Invicta is a cost effective solution, providing a durable long lasting single barrier solution to your security needs.